Two revisions later we have something closer to “child tamper proof”. Our prototypes are on their way out to many eager children! Hooray! If you are interested in receiving them for your pilot please send me an email to: tom.boonsiri@gmail.com. We will soon release a few prototypes for private purchase (under a G1G1 model to help finance further prototypes for the pilots). Stay tuned for more details. 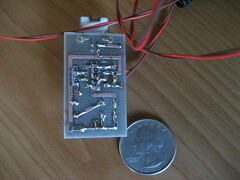 Big thanks to Mike Koop and Dan Ehlers for their efforts on the latest PCB layout. Another big thanks to the guys at Liquidware/GL Interfaces for subsidizing the cost of a component. I’d like to encourage everyone to build on the great work of Arjun Sarwal and help us extend the sensor interface with our peripheral — the heart rate monitor. It’s a relatively simple device that measures the blood flow in your finger with an infrared sensor. 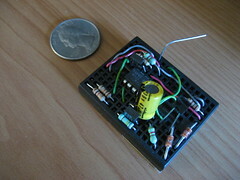 Powered by USB, the device sends measurements to the XO via the AC/DC sensor interface (audio jack). Using a Measure variant with a heart beat detection method, we are able to display the heart rate (as shown in the pic). If you’re a developer interested in integrating biofeedback into your application, please email me for more details on how you can get your hands on a few of our peripherals. Otherwise, we are looking for developers who can help us evolve the Measure activity to better suit the lesson plan we have created for the device. 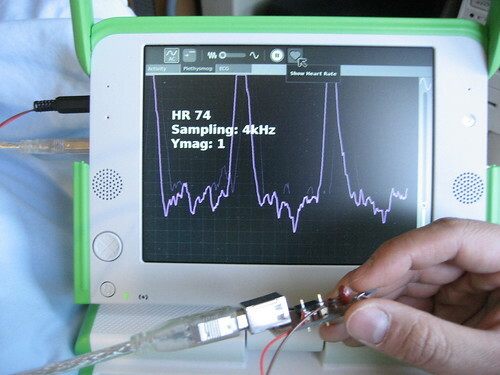 The device is not of clinical quality and solely for educational purposes. We are definitely interested in feedback on our direction. In the short-term, it would be interesting to develop a gui where you could structure a family tree (even extending it to branches for relatives) and allow kids to record measurements for various family members. This could potentially evolve into other health education efforts with a wiki backbone to support health wellness. Further details on their blog. You can also join the OLPC Goldenstate mailing list. Update: The Heart Rate Monitor is available for pre-order at XOexplosion. I am a college student involved in a program that does project based learning. Our current project is to help a member of the campus dance program create a show in which the music and lightning synced with her heart beat. The problem we have run into is transmitting a live feed from the body sensor to the computer. I was curious about what I read where you inputed your signal through the audio jack. Do you have a product that we could purchase that sends a live feed through the audio jack as an audio stream? Also, if you are looking for research or aid developing your product, you could speak with our coordinator to use the Universities resources. Many groups come to us with ideas and allow us as part of our education to expand on their concepts and create presentations or demonstrations to help the growth of their project. This is a great ideal and a better future for the children. Keep on doing the good works for better tomorrow. A reputed caridologist in a small town in Karnataka India has set up a Foundation which provides free cardiac treatment to the underprivileged in the area. While they do have equipment for the 64 Slice MDCT Angiography etc. where tests can be expensive catering to those who can afford such tests……he does feel that we can do a lot for poorer people in rural areas who can avoid the cost and inconvenience of travelling long distances, if we can set up a facility to record some basic health data and transmit it electronically. The XO seems to have the potential for a low cost Telemedicine solution fitted with the device you talk of. The foundation has a small fund for research and I wonder if there is anyway to take this forward. Could we have a small team do a test and set up a pilot project here. These are dedicated doctors with adequate infrastructure facilities, a lot of medical and nursing colleges in the vicinity and a needy population segment. That’s great guys, I will follow up with you via email. We would like to offer project hosting if you need it. We are a open source hardware community with the purpose of taking hardware projects to the next step, offering them a home and a meeting place for feedback and improvements.